Home » Posts tagged "prints"
In conjunction with Dr. John Bowles’ ARTH 287 and ARTH 387 classes, six works by contemporary African-American artists are on view now through Sunday, May 10th, in the Study Gallery on the second floor of the Ackland. Perhaps the most eye-popping in its resoluteness and arresting color is Idrissa Ndiaye, a study in oil on paper by Kehinde Wiley. Undoubtedly, Wiley is having a cultural moment: the 37-year-old artist is enjoying his first retrospective at the Brooklyn Museum, and numerous examples of his work can be spotted on the set of Fox’s breakout new show “Empire.” Figurative, dramatic, and bombastically colorful, his art has all the necessary ingredients to be readily accessible to modern audiences. Perhaps it is this enthusiasm for experimentation that makes Picasso so infinitely intriguing to modern audiences. While most known for his pioneering Cubist works, Picasso’s full oeuvre reflects an extraordinary diversity of artistic styles. He was an artistic alchemist, continuously testing the possibilities of form, abstraction, composition, and color. In honor of staying up way-way-way too late yet again to finish a book, I give you The Bookworm by Arthur Paunzen. Something about the enormous stacks of books crowding the figure just speaks to me. Also his complete disregard for the huge spider over his head. Now that I would likely notice. I will endeavor to go to sleep earlier from now on, but I’m sure some book will inevitably keep me up. Arthur Paunzen, Austrian, 1890-1940: The Bookworm, 1920; drypoint. Ackland Art Museum, The University of North Carolina at Chapel Hill, Burton Emmett Collection, 58.1.1774. Dana Brand is part of the three-person team working to make digital images and metadata for all 17,000+ objects in the Ackland’s collection available to the public online. She’s a self-described “Army brat” who landed longest in Winston-Salem, NC, before coming to UNC-Chapel Hill for both her Bachelor’s (English and Media Studies) and Master’s (Information Science) degrees. Dana first got into digitization, and metadata in particular, as an intern at the Digital Production Center in Wilson Library while in graduate school. This small series of prints just lifts my spirits and I wanted to share! Ghislain Bleriot, French, born 1951: “Herbal: Impatiens” (“Herbier: Impatientes”), n.d.; drypoint and sulfur tint, printed in color. Ackland Art Museum, The University of North Carolina at Chapel Hill, Joseph F. McCrindle Collection, 2010.3.50. Megan Williams is an intern in the Ackland Art Museum’s Education and Curatorial departments and an MS Library Science / MA Art History candidate at UNC-Chapel Hill. Artists often turn to their city for creative inspiration. Sometimes they represent exactly what they see down to each minute detail, other times, they produce a barely recognizable impression. Some of the prints in the exhibition America Seen are images of real things and places that still exist today. While researching these prints, I was eager to find the locations depicted. Like photographs, prints can be used as historical records, and they are capable of showing us a vision of an unknown or forgotten past. Abigail Wickes is a digital image technician at the Ackland Art Museum, and is part of the three-person team working to make digital images and metadata for all 17,000+ objects in the Ackland’s collection available to the public online. She became interested in digital image cataloging during an internship at the North Carolina Biotechnology Center while she was working towards her Master’s in Library Science at UNC-Chapel Hill (2012). 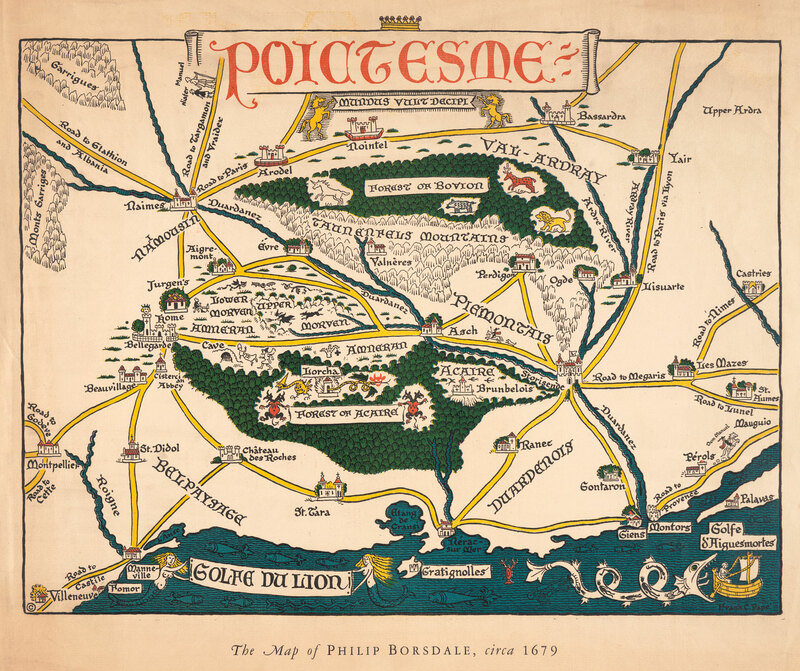 Frank Cheyne Papé, British, 1878-1972: Poictesme: the Map of Philip Borsdale, 1674, 1920s, color line block.